Christians are projected to remain the region’s largest religious group, growing from 517 million in 2010 to more than 1.1 billion in 2050. But the Muslim population is expected to grow at a faster rate than the Christian population (170% vs. 115%), rising from 248 million to 670 million. 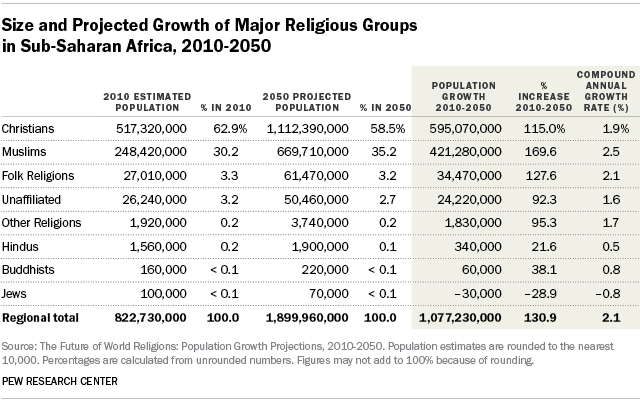 Most of the smaller religious groups in sub-Saharan Africa, including adherents of folk religions and the religiously unaffiliated, are expected to experience at least modest growth in the decades ahead, although the small Jewish population is projected to shrink. While the absolute number of Christians in sub-Saharan Africa is expected to double in size by 2050, the Christian share of the region’s population is expected to decline, dropping from 63% in 2010 to 59% in 2050. Meanwhile, the Muslim share is projected to increase from 30% to 35%. 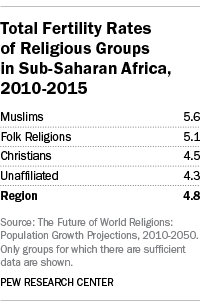 The Total Fertility Rates for the two fastest-growing religious groups in sub-Saharan Africa – Muslims and adherents of folk religions – are higher than the rates for Christians and the unaffiliated. However, fertility rates for all major religious groups in sub-Saharan Africa are considerably higher than the replacement level of 2.1 children per woman. The groups projected to experience rapid growth in sub-Saharan Africa in the decades ahead had very young populations in 2010. Nearly half of the region’s Muslims (46%) were under age 15, as were 44% of those adhering to folk religions, 41% of Christians and 40% of the unaffiliated. 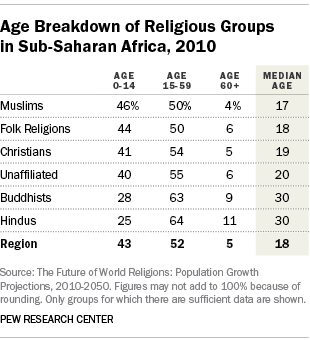 The median ages of these groups ranged from 17 (for Muslims) to 20 (for the unaffiliated). The median age for the region overall was 18. Religious switching is expected to change the religious landscape of sub-Saharan Africa in future decades only modestly. (For information on the impact of religious switching on the demographic projections in this report, see Chapter 1.) 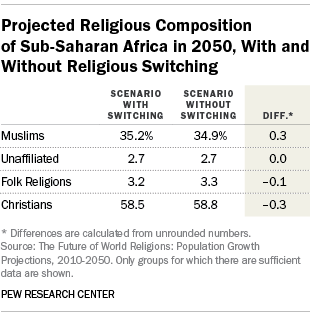 The Muslim share of sub-Saharan Africa’s 2050 population is expected to be 0.3 percentage points higher than it would be if projected religious switching were not taken into account. By contrast, the projection for the Christian share of the region in 2050 is 0.3 percentage points lower than if religious switching were not included in the projections. In the decades ahead, more migrants are expected to move out of sub-Saharan Africa than move into the region. This outbound migration is not expected to have a large impact on the overall religious composition of the region. Consequently, the report does not show different projection scenarios with and without migration for this region.